We may be deep in the throes of the sedanocalypse, but make no mistake that the 3 Series is still vital to BMW and its bottom line. And even as it faces more and more competition each year, and as it’s gotten bigger and heavier over the years, it’s still probably the sport sedan benchmark. Here’s the new generation of 3 Series that will lead this famed model into the future. First: the car is set to officially debut this week ahead of the Paris Motor Show (and we have interviews lined up with BMW engineers on how they worked to add some spice to how it drives) but some configurator pics leaked early on Carscoops and BMW Blog, among other places. Here’s an early first look before you were meant to see it. Second: yes, this is an all-new car, even if it may not look that way at first glance. 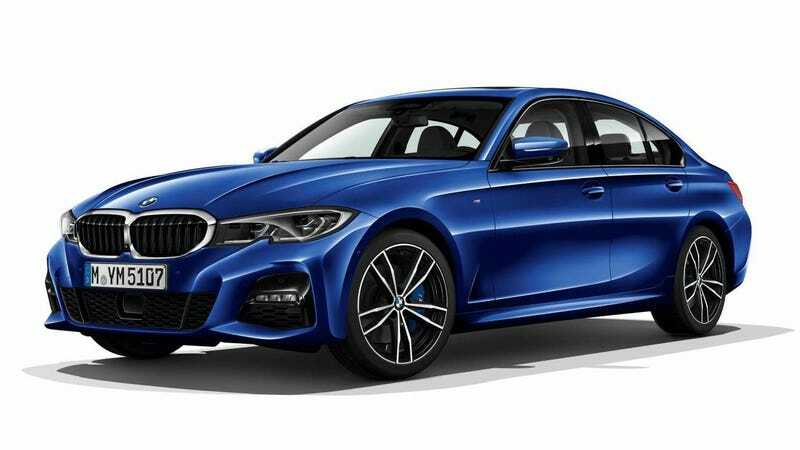 This is the G20 3 Series, based on the same modular scalable platform that underpins the latest 5 Series and 7 Series (and the new Toyota Supra, hilariously.) It’s said to have more interior room than the outgoing car while cutting back on its weight. Right off the bat we get a more aggressive front bumper and these staggered headlamps that give it a sharper overall appearance than the old car, as well as the bigger 5 and 7. Also the famed Hofmeister kink on the C-pillar is more angular than it’s been in a while, a nice change. Beyond that, it’s very clearly a 3 Series, more a design evolution than revolution. I like it. Don’t mess with what’s not broken, and all that. The taillights are totally different, too. I also like how those shaped up. There are some nice updates inside as well, including a full-screen digital dashboard for the first time ever, a more centrally located touch screen, new controls on the steering wheel and, curiously, no gearshift lever on some of the models seen here. What does that mean? And where’s the manual? The new 3 will launch with a suite of four- and six-cylinder turbo engines. More details and photos coming this week for sure.